We’ve come a long way from weekly pay packets and cash under the mattress. Today’s high-tech banking system offers a multitude of technological aids which make payments and access to money easier and quicker: we take for granted the availability of ATMs, chip and pin and contactless cards, credit cards, direct debit, online and mobile banking. 32% said they did not plan for the future. 10% of consumers are permanently overdrawn. As of February 2014, there was over £7 billion outstanding on overdrafts in high-street banks, and although this figure has fallen since 2010, it is still over 60% higher than it was in 1997. Overdrafts cost the consumer dearly – the average cost of borrowing £100 for a month in an unauthorised overdraft was £37 whilst in an authorised overdraft, it could still cost as much as £30. Unarranged overdraft charges stood at 1.7 billion in 2011, and maintenance charges from arranged overdrafts were £448 million. How behavioural economics can help to explain some of our inefficient money management behaviour beyond the explanation of financial illiteracy. We then go on to examine some innovative retail bank accounts, which are leveraging new technology with behavioural economics – a particularly strong combination - to help us keep better track of our finances. In what is fast becoming a cashless society, the way we spend money now is very complex, with debit cards, credit cards, and an increasing multitude of different services (utilities, mobile phones, broadband, cable TV etc) to be paid for, often in different ways. Services like these are typically charged for monthly, quarterly or bi-annually unless we specifically arrange for a date of our choice. This can make it difficult to work out how much of our balance is actually money we can spend and means unexpected bills can sometimes surprise us. A recent FCA report found that many consumers admitted to going overdrawn simply through administrative errors on their part, combined with no warning from their bank. Overdraft facilities can also be mentally accounted for as ‘money we can spend’ rather than debt, simply because that's how banks frame the facility. The same FCA report noted that some banks describe an overdraft facility as ‘funds available’ or 'available balance', making a customer feel entitled to that money. For many of us, automated pay goes into our current account on a monthly rather than weekly basis meaning we have to budget and spread our spending to make our money last. Where we used to pay by cheque, diligently recording the details of payments and 'balancing' our cheque books, paying by debit and credit cards can mean we have no daily visual reminders of how much money we can safely spend. Online banking has now largely displaced paper bills meaning that we have to consciously remember to log on to check our balance and analyse and track our spending. All these reasons combine to make it difficult for us to mentally account for our money. The concept of mental accounting, first identified by behavioural economist Richard Thaler, shows how we have a natural inclination to categorise, compartmentalise and treat money differently depending on where it comes from, where it is kept, or how it is spent. For example, we might be reluctant to spend money we have already mentally allocated to paying our rent on buying a new car. Cass Sunstein and Richard Thaler highlight a similar old-fashioned example of mental accounting in their popular book ‘Nudge’: early in their careers Dustin Hoffmann and Gene Hackman were good friends and used to live on very little. When Hackman visited Hoffmann one day, Hoffman asked him for a loan. Hackman agreed, but was then confounded by a row of jars filled with money, labelled ‘rent’, ‘utilities’ and so on lined up on the counter. When Hackman asked why Hoffman needed a loan with so much ready cash available to him, Hoffman simply pointed to the empty jar labelled ‘food’. Some employers in the 1950s used to encourage services to help their employees manage their money and make sure their bills were paid. Secure Homes (now Secure Trust Bank) would set up a table in a West Midlands factory for people to hand over a proportion of their weekly pay which Secure Homes would use to pay people’s bills. 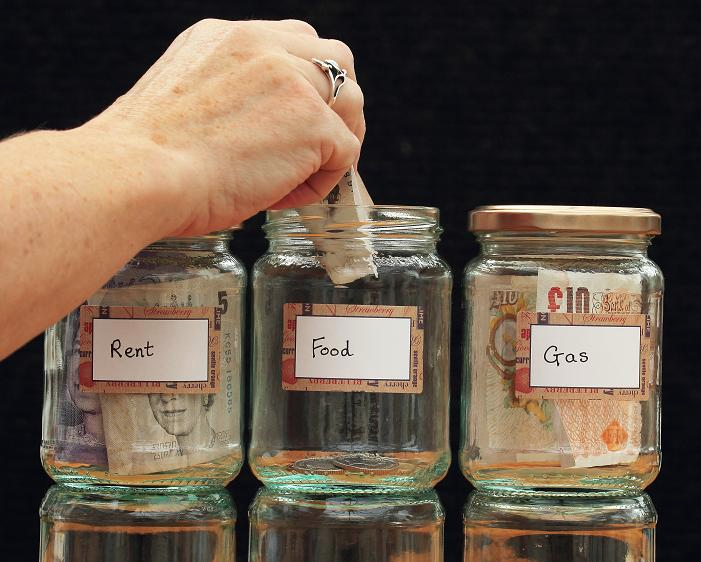 This service put the allocated money out of sight, out of reach, thus reducing the temptation to spend and leaving households with a very clear understanding of what they had left to spend each week. Without these kinds of services, or simple jam jars to compartmentalise our cash, people can struggle to keep track of and manage their money. 2) Spending is less visible and therefore less painful and salient today: Before we had debit and credit cards, we had to hand over actual money – physically part with it - and after a purchase our wallets were emptier and lighter which made spending salient (we could see exactly what we had spent) - so it was more painful too. The behavioural economic concept of loss aversion tells us that we feel the pain of a loss more than we feel the satisfaction of an equivalent gain. So paying with debit and credit cards is less painful because we don’t have to give anything up. We hand our cards over and then get them back again and an invisible transaction has taken place. We make automatic contactless payments in this way which we hardly notice. Research supports this finding – several studies have found that our willingness to spend is far greater when paying by credit or debit card than if we have to hand over the cash. Research has also found evidence that we can be primed to spend more simply by seeing the credit card logo on our card. Not only do we feel less pain, however, but it’s also harder to keep track of what is left in our ‘wallet’ or bank account. When paying with cash, spending is more salient and evident since your wallet gets emptier. Debit card payments also provide no record of our daily spending, unless we purposefully and diligently log on to our accounts and even then the payments may not necessarily have been processed. 3) The temptation to spend and the ‘power of now’ dominate today’s world: We can be impulsive and prefer to spend now leaving saving for later, and contemporary systems make this phenomenon increasingly available. Paying with credit cards taps into our tendency to discount the future, but there are many other ways to access credit today too, including pay-day loans and loan systems like Wonga. Most recently Paypal, the online payment technology system, introduced an opt-out system which allows users to pay for items once they are delivered – allowing people to buy and receive a purchase before they've actually paid for it. Timed carefully, this could mean spending next month’s pay, this month - a type of short term credit system. With such easy ways of spending, saving, as behavioural economist Sendhil Mullainathan points out, is often just 'what didn’t happen - what is left over after we’ve made all our active decisions about what to buy' rather than a positive decision and tangible effort to save. 4) Current account inertia and status quo bias: We are all creatures of habit, and often fear change or procrastinate about it. One example of sticking to the status quo is staying with the same bank over a lifetime, despite poor service. Switching rates have been very low in the UK – at around 3-4% in the past few years, despite poor customer satisfaction rates among the majority of the big high street banks. Most of the top banks like HSBC, Santander and NatWest scored less than 60% in recent customer satisfaction surveys. Yet our relationship with our current account lasts longer than the average British marriage. We are also prone to generational inertia combined with authority bias, with young people typically banking with their parents’ bank. Nearly 60% of 18-24 yr olds bank where their parents do. The new Current Account Switch Service implemented in September 2013 by 33 bank and building society brands and spearheaded by The Payments Council was intended to facilitate switching from one bank to another, but has only increased switching by 14%, to 609,300 switches per year. Recent analysis by Which? also questions whether consumers actually make good switch decisions due to choice overload, complexity of comparison and other cognitive biases which lead them to make sub-optimal shortcuts. Behavioural economics is a bit of a buzz idea among financial services providers the world over, many of whom are looking at how to tap into this way of understanding consumer behaviour. Nimble financial innovators, particularly in the US, are creating cutting edge products and services and household names are rethinking the ways in which they serve their customers - all to help us manage our money better. In the second part of this article, we list two behavioural economic concepts which are inspiring innovation amongst regulators and financial providers. The great thing about the old-style set of jam jars was that it was pretty obvious when funds were getting low, so they provided an automatic alert to stop spending or a prompt to take action to ensure households made their money last through the week. Today, people often accidentally go overdrawn, not realising the poor state of their account balance and what bills are due, and as a consequence end up paying significant bank charges, which may also take them by surprise. But technology – via mobile apps, SMS and online banking - is now allowing for simple, automatic warnings. Giving cues for financial action: For example, UK-based thinkmoney provides its banking customers with a current account which has a number of features to enable people to manage their money better. One key design is that there is no overdraft feature at all, committing its customers to always being in the black. It also provides an online forecasting feature that gives automatic feedback to customers about the state of their balance. 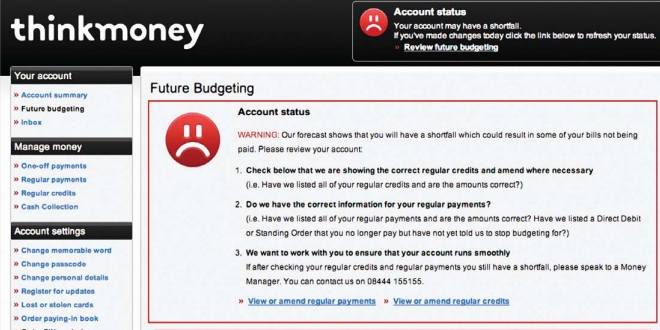 When customers log on to their account, the default homepage displays either a green smiley face meaning everything is fine, or a red, sad face which indicates urgent action is needed to ensure they have enough funds, and suggesting that bills may go unpaid due to insufficient funds in their account. Behavioural science often uses smiley or sad faces to get people’s attention and provide them with a salient cue to prime them to change their behaviour (red, sad) or a cue to affirm and encourage their behaviour (green, smiley). In this case, 96% of customers who see thinkmoney’s red status message take some sort of action such as contacting their money manager, amending payments or reviewing expenditure. Salient, automatic alerts: Another approach is US-based PNC Bank’s calendar-based online alert for its Virtual Wallet account. 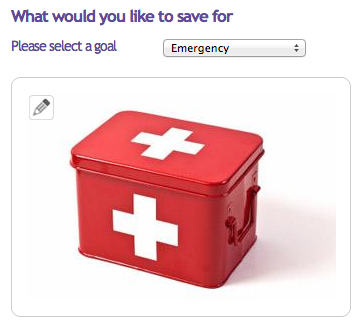 They automatically alert customers if they are in danger of going overdrawn – a simple default built into the service. The online alert is called Danger Day, is bright red and therefore very salient, priming attention and action. Customers are unlikely to miss it in their customised online calendar. Changing behaviour by changing the default: Regulation can also alter our financial environment in order to steer behaviour. In the US, a regulatory change in 2009 tackled the problem of customers accidentally going overdrawn. The new Act stipulated changing from a system where the default automatically allowed a customer to go over their limit or overdrawn, to a required choice design where banks and credit card companies were required to notify customers that they were about to go overdrawn, explain their overdraft services and require them to ‘opt-in’ to the service. Federal Reserve governor at the time, Elizabeth Duke said 'Our rule will help consumers better understand the T&Cs of overdraft services and will give them an opportunity to avoid fees…'. The change significantly reduced a huge revenue source for banks as customers became more aware of when they were going overdrawn and the fees charged. For example, Bank of America reported a $10.4 billion write-down in the value of its credit card unit, which they blamed on the new regulations to limit debit fees and other penalties. A number of banks now offer a ‘modern day jam jar’ account, leveraging the behavioural economic concept of mental accounting. These accounts help customers allocate their money to ensure bills are covered and prevent overspending on unnecessary items. The most innovative examples of this come from across the Atlantic, where there have been several behavioural economics-inspired banking and personal finance services launched in recent years. - a separate growth account for long term savings with higher yield interest rates. This framework is further strengthened by a visual feature customers can see online or on the mobile app - Virtual Wallet’s money bar, showing the amount free to spend once the reserve and bill payments scheduled out that month are accounted for (see image). This helps to ensure that customers do not go overdrawn and spend appropriately. 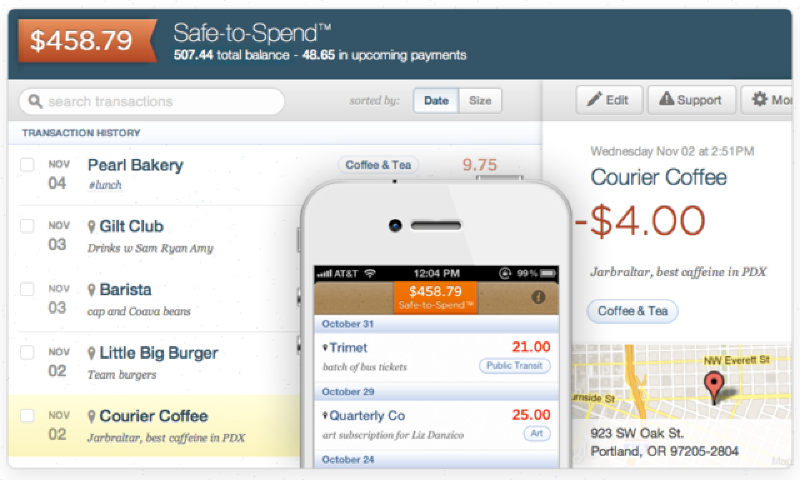 Using the Slider, customers can instantly move money back and forth between their Spend and Reserve accounts. Virtual Wallet also automatically tracks all regular bill payments scheduled each month, meaning that customers do not need to manually calculate and allocate enough money to cover bills themselves, the bank does it for them as a default. 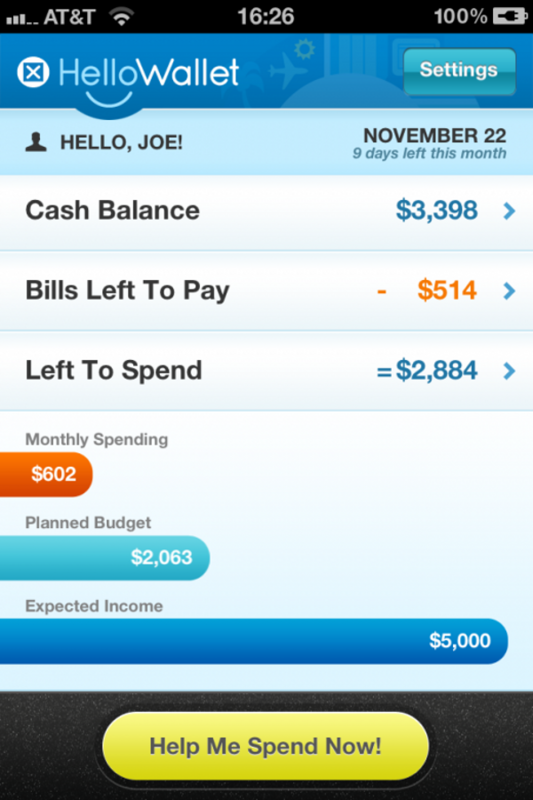 Bill payments are all displayed on the customer’s personal online calendar. Simple Bank, a new bank launched only a few years ago (and who recently sold to BBVA for $117 million) draws heavily on insights from behavioural economics. Their account automatically segregates a customer’s account into scheduled payments and savings goals, displaying a ‘safe-to-spend’ figure - what is left after bills and savings have been subtracted. Simple Bank say they now have data which illustrates how providing their customers with useful information, real-time notifications, and features like Safe to Spend has had a positive effect on personal finances. HelloWallet, a rapidly growing, personal financial management service run via an employer, with a strong practice of drawing on behavioural economics, also segregates a customer’s bill payments from their spending money online and in their mobile app, leaving people with a clear ‘Left to Spend’ amount not already allocated to a particular purpose. HelloWallet’s software also provides users with feedback on their financial behaviour, tracking different types of spending eg food, bills or travel, but notably, can also aggregate spending from one location providing detailed feedback. So users’ habits stare back at them – ‘Did I really spend £260 in The Dog and Bull last month? !’, or ‘I can’t believe that my daily trips to Café Nero cost me £120 per month!’. Three months after they launched in May 2011, HelloWallet was already delivering impressive results. The average employee found $400 of cost savings through HelloWallet’s personalised recommendations and tips, increased their overall savings by $2,100 and paid off debts faster than their peers. Behavioural economics continues to become more widespread in its applications – in this case across the financial sector. And, as behavioural science experts often point out, having a clear understanding of behavioural economics also provides us with the frameworks and specific concepts to understand (in this case, undesirable) consumer behaviour with far more precision, and through this understanding how we might successfully change it for the better. The innovative mental accounting or ‘jam jar’ features of forward-thinking, technologically innovative accounts are making managing our money increasingly effortless, and sometimes even fun, rebranding and reinvigorating a sector that has often suffered from a grey, rather serious image. These features, combined with salient, automatic alerts, new defaults, cues and feedback loops, really help to change customers' behaviour as they give them warning to act and avoid fees. The Credit Card Accountability Responsibility and Disclosure Act of 2009 or Credit CARD Act of 2009 was passed in the US on May 22nd 2009.